All schools in the Olmsted Falls School District will be closed due to inclement weather conditions on Wednesday, February 2nd. As anticipated, and publicized in last week’s blog update, the School Board did make a decision at their regular monthly Board meeting last week regarding the 2.8 mill drop-off, scheduled to occur in 2012. Following additional discussions on the issue, the School Board passed a resolution (5-0) to place a 2.8 Mill Permanent Improvement Levy, which will not raise taxes for our residents, on the May 2011 ballot. Passage of this issue in May will secure additional financial resources that will be dedicated to maintaining facilities throughout the District. There will be a series of public meetings planned to provide additional information and answer questions. The first informational meeting has been scheduled for next Thursday, February 3rd at 7:00 p.m. in the Middle School Library. Superintendent Dr. Todd Hoadley will provide an overview of the 2.8 Mill Permanent Improvement Levy and answer questions. All parents and residents are invited to attend. Always seeking new ways to stretch limited financial resources, the Olmsted Falls School District was able to expand upon its partnership with Polaris Career Center this year to add new engineering courses to the Olmsted Falls High School curriculum. The new pre-engineering courses are part of the “Pathway to Engineering” program and are designed to help high school students make an informed choice about their future by exposing them to concepts and courses necessary to be successful in the field of engineering. The curriculum is provided by Project Lead the Way (PLTW), an organization devoted to preparing students to be innovative and productive leaders in the fields of Science, Technology, Engineering and Mathematics. Students not only receive high school credit for PLTW courses, but also have the opportunity to receive college credit by passing the final exams. There are four classes in the new “Pathway to Engineering” curriculum: Introduction to Engineering Design, Principals of Engineering, Digital Electronics, and Engineering Design and Development. Engineering instructor Mr. Mike Haydn works with students during the new Introduction to Engineering Design course at Olmsted Falls High School. All Project Lead the Way Courses are taught on-site at Olmsted Falls High School utilizing teachers funded entirely through Polaris Career Center. There are currently 40 Olmsted Falls High School students enrolled in two sections of the introductory engineering course being taught by Mr. Mike Haydn. The hands-on, interactive nature of the Introduction to Engineering Design course has received many positive reviews to date. “Pathway to Engineering” is the second set of course offerings to be introduced at Olmsted Falls High School in partnership with Polaris Career Center and Project Lead the Way. Last year, a “Biomedical Sciences Program” was launched through the partnership. Now in its second year, there are 55 students currently enrolled in Biomedical Sciences Program courses. Both PLTW programs offer four courses each, with each course building upon the next. Entering either the “Pathway to Engineering” or “Biomedical Sciences” programs in their freshman year allows students the opportunity to complete all four courses in their selected program. It is possible for sophomores, juniors and seniors to enroll in these specialized courses as well. For additional information about the PLTW Biomedical Sciences Program or Pathway to Engineering at Olmsted Falls High School, please contact your student’s School Counselor. Information tables for both PLTW programs will also be on display during the upcoming Freshmen Orientation night on February 24th at 7:00 p.m. Parents can also find detailed information on these courses in the current High School Program of Studies available on the Counselor’s Corner web page of the High School website. School Board recognizes District Food Service staff. Quality employees make up a quality organization. Two groups of employees were publicly acknowledged at last week’s Board of Education meeting. Director of Food Service Denise Tabar and the District’s four cafeteria managers were recognized by the School Board for receiving the 2010 Stellar Award for Excellent Nutrition Practices. This award recognizes our Food Service Department’s innovative use of best practices to promote a healthy school nutrition environment, and is a tribute to the entire food service staff. School Board recognizes District Technology staff. Director of Technology Joe Magrey and District technology staff members were also in attendance at last week’s meeting to receive special recognition from the School Board for their hard work and dedication in conjunction with the construction of the new Intermediate School and the recent expansion and technology upgrades in the Middle School. These two projects required a complex coordination of vendors and extreme attention to detail. The efforts of our Technology Department have resulted in state-of-the-art technology and improved efficiencies for our students and staff. The School Board also approved the recommendation for Olmsted Falls School District to apply for an additional 2-year waiver for the State’s unfunded All Day Kindergarten mandate. Last year, the District received a 1-year waiver which is in effect for the current 2010-2011 school year. The new, 2-year waiver will allow the District to postpone implementation of an All Day Kindergarten program for both the 2011-2012 and 2012-2013 school years. While District finances necessitate applying for the 2-year waiver application, the Board of Education has given the Superintendent the authority to explore potential partnerships that could provide before/after school care solutions for parents seeking to fill the other half of the day for kindergarten students. Dr. Hoadley is currently engaged in conversations with various day care providers to determine the feasibility of having an outside, third-party entity operate a program utilizing vacant classroom space at the Early Childhood Center. Bulldog hockey players - past and present! 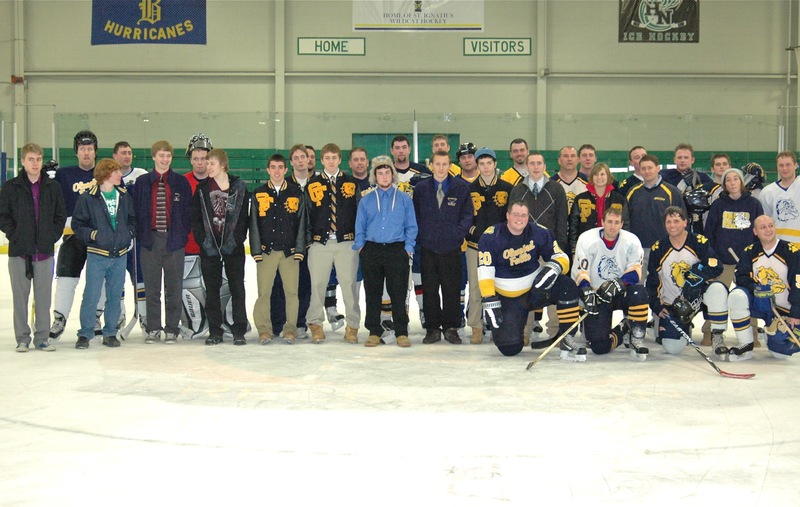 The Olmsted Falls High school Hockey Team hosted an Alumni Hockey Game prior to its regular varsity game against Amherst this past Sunday. Participating alumni players ranged from recent grads from the Class of 2010 to Bulldog alumni who graduated in the 1970s. Current players joined alumni players on the ice for a group photo (at right). Olmsted Falls Board of Education Meetings are generally held on the third Thursday of each month at 7:30 p.m. The location of the meetings rotates to a different school building each month. Please check the website to confirm dates, times and locations. Changes in dates, times and locations are posted on the website. Get your act together for the 24th Annual High School PTA Friday Night Live Talent Show! OFHS PTA is looking for students to share their talent! Come and audition Saturday, January 29th at the high school auditorium between 9am and 12 noon. Bands can submit a tape before January 29th. For more information, contact Elaine Atkinson at 235-8821 or Debbie Henton at 235-5402. Attention parents of high school students for the 2011-12 school year! Are you interested in learning more about a program that allows high school students to take college level courses for both high school and college credit at no cost? You are invited to attend the Post Secondary Enrollment Options Program (PSEOP) informational meeting next Thursday, February 3rd at 7:00 p.m. in the OFHS auditorium. Please contact your high school counselor with any questions or if you are unable to attend and would like information. On Saturday, February 5th, the Olmsted Falls High School Academic Team will be hosting an NAQT Tournament at the High School all day. The Academic Team is seeking parent and/or community volunteers to help as readers for the tournament. If you are available and interested in helping, please e-mail Academic Team Advisor Mrs. Rhonna Smith at rsmith@ofcs.net for additional details. Planning meetings for the “Dance It Up 4 Kids Health” event on March 19th at the Middle School are every Tuesday 6:00-7:30 p.m. at the Falls-Lenox Media Center. Any interested community member, including students, are welcome to attend. Start practicing! We’ll begin signing up participants for the Mini-Dance Marathon and Dance Exhibition (amateur or professional, serious or fun) in February. Anyone of any age can participate. Olmsted Falls Rec Soccer Program Registration – THIS THURSDAY, JANUARY 27th, 5:30 – 7:30 p.m. in the Olmsted Falls Middle School Cafetorium. This league is for players Pre-K – 8th grade. If your child will be 4 years old before April 15th, you can sign them up to play in the Olmsted Falls Rec Soccer Program on Saturday mornings at the Shady Road Soccer Fields. To register, please plan to attend this Thursday’s registration session, or please visit our web site at http://olmstedsoccer.wordpress.com. Should you have any questions, please feel free to contact Kim Cleary at clearysoccer@att.net. BALDWIN-WALLACE COLLEGE “Take a Kid to the Game” Events – Saturday, January 29th and Saturday, February 19th. All area students in grades K to 8 will be admitted free of charge to two upcoming Yellow Jacket women’s and men’s basketball double-headers with a paying parent or adult. For additional details, please click here. The School Board will continue discussions on the 2.8 mill drop-off, scheduled to occur in 2012, and the opportunity to place an issue on the ballot that would bring additional financial resources to our District without raising taxes for our residents. It is anticipated that the School Board will make a decision this evening regarding whether to place an issue on the ballot in May. If a decision is made to place an issue on this May, the Board will also be deciding whether the issue would be a 2.8 Mill Permanent Improvement levy or a combinations 2 Mill Permanent Improvement levy and a 0.8 Mill Bond issue. For additional information on the topic, you may find this recent article from the Sun Post-Herald of interest. The Board of Education is also expected to approve a recommendation from the Superintendent tonight for the District to apply for an additional 2-year waiver for the State’s All Day Kindergarten unfunded mandate. Last year, the District received a 1-year waiver which is in effect for the current 2010-2011 school year. The new, 2-year waiver would allow the District to postpone implementation of an All Day Kindergarten program for both the 2011-2012 and 2012-2013 school years. While District finances necessitate applying for the 2-year waiver application, the Board of Education has given Superintendent Dr. Hoadley the authority to explore potential partnerships that could provide before/after school care solutions for parents seeking to fill the other half of the day for kindergarten students. Dr. Hoadley is dialoging with various day care providers to determine the feasibility of having an outside third-party entity operate a program utilizing vacant classroom space at the Early Childhood Center. First semester exams for high school students began today and continue through the end of this week (Jan. 19-21). Please click here to review the exam schedule for Olmsted Falls High School. OFHS Academic Team members Mike Coury (Sr.), Jim Coury (Sr.) and Sohan (Jr.) with Academic Challenge host Jason Nicholas. It was a very good weekend for the Olmsted Falls Academic Team. On Saturday, the team traveled to Warren G. Harding High School for a tournament where they had two varsity and two JV teams compete. The A Team went 8-1, B Team went 9-0, C Team went 9-0, and D Team went 8-1 – bringing back many trophies and impressing onlookers at the tournament. Academic Team members Mike Coury, Jim Coury (team captain) and Sohan Vartak then appeared on Academic Challenge at TV 5 in Cleveland on Sunday morning. Olmsted Falls competed with Ravenna High School and Tallmadge High School in this match up. This record-setting episode will air on WEWS TV5 on March 12, 2011 at 7:00 p.m. Be sure to mark your calendar and set your DVR. This is an episode no Bulldog will want to miss! This first planning meeting for the “Dance It Up for Kids Health” event is TONIGHT, Wednesday, January 19th from 7:00 – 8:30 p.m. at Falls-Lenox School Media Center. All interested individuals who would like to share their time, knowledge, enthusiasm and area of expertise are encouraged to attend. The “Dance It Up for Kids” planning committee is looking for individuals from high school students to seniors and local businesses that are willing to join a working committee and/or to donate money, goods or services to help with this event. (Please see additional event details below in “Upcoming Events” section). Some of the things committees will be working on are soliciting donations and sponsors, marketing and advertising, soliciting event participants, and helping the day of the event. Taylor Connelly, a first grader in Mrs. Schiely’s room, wrote an essay about her cousin Kate, who has a disability. 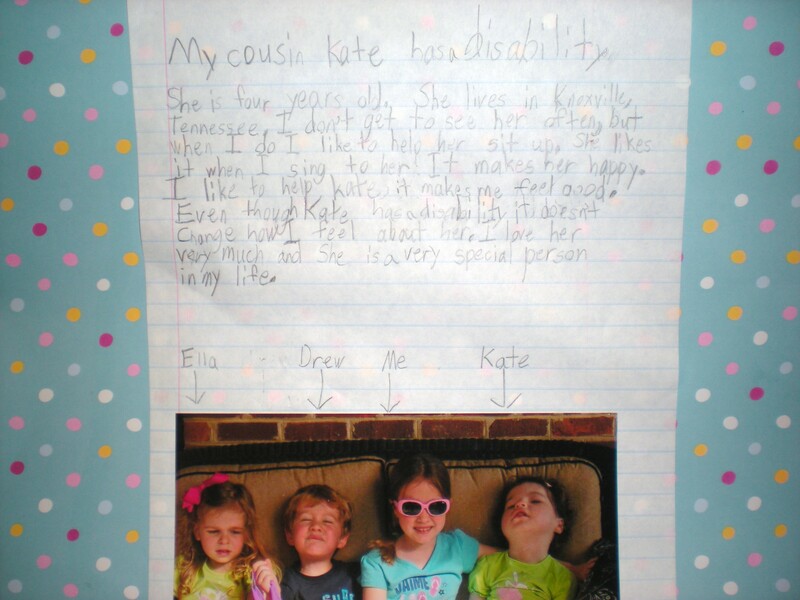 Taylor writes, “even though Kate has a disability it doesn’t change how I feel about her. I love her very much and she is a very special person in my life”. There was a tie in the second grade. Hailey McCullar, from Mrs. Vormelker’s class, submitted a wonderful poster that read “We all have a Spark”. Lindsey LaPinta, from Mrs. Gommel’s class, also submitted an outstanding poster that read, “Just like butterflies are different but the same – So Are We”. The third grade winner was Julia Candow, from Mrs. Richmond-Smith’s class. Julia wrote a heartwarming essay about her “special friends” at Falls-Lenox – including a description of each which focused on their talents and gifts. Thanks to all the students who submitted an entry, and thanks to Mrs. Robin Scott, School Psychologist, for organizing another informative week for all the students. To view photos taken during Disability Awareness Week, please click here. The Local Scholarship application form is available in the guidance office and available online at the Counselor’s Corner on the high school web-site. All completed application forms are due by February 11, 2011 at 3:30 p.m. in the high school guidance office. Please contact Mrs. Laut with any questions (440) 427-6116. The OFHS wrestlers placed 6th at the 43 team Bill Dies Memorial over this past weekend. Place winners include: P.J. Mueller 103 (3rd), Chase DuPratt 112 (4th), Nick Asadorian 119 (7th), Brian Slater 145 (6th), and Nick Sommer 160 (4th). The team set a new school record during the opening round Friday evening, scoring 50 first round points. This breaks the record of 43 first round points in a tournament set by the 2001 team which finished 5th in the State and won the Medina Invitational. Those 50 first round points had the Bulldog squad in first place after round one. This demonstrates the strength the Bulldog wrestling team is building. The team had 12 first round pins, and one regular decision. Up Next: The New Albany Invitational next Saturday for the Varsity, and the Firelands Varsity tournament for our Varsity B. For additional information on the Olmsted Falls High School wrestling program, please visit: www.ofwrestling.com. More than 90 young baseball players signed-up to attend the 1st Annual Olmsted Falls Baseball Holiday Skills Camp at Up to Bat in Brook Park December 22nd-23rd. Players were instructed on all aspects of baseball by the OFHS coaching staff, current Bulldog players, and former Bulldog standouts. Coach Dan Largent commented that it was great to see so many young players who love the game of baseball come out for the event. “It was a great 2 days of baseball in December,” Coach Largent said. 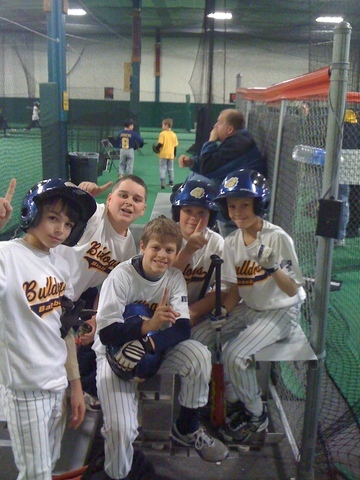 For more pictures from the baseball camp and additional information on the Olmsted Falls baseball program, please visit: www.ofbaseball.com. Falls-Lenox/ECC PTA is pleased to have Dr. Jim Lloyd, Assistant Superintendent, and Mercedez Hathcock, representing Ohio PTA, as our featured speakers at our next PTA General Membership Meeting scheduled for next Tuesday, January 25th. Both will be speaking about the Common Core State Standards, which have been adopted by the Ohio Department of Education in 2010. These standards will provide a consistent, clear understanding of what students are expected to learn so that teachers and parents know what they need to do to help them. These internationally benchmarked K-12 standards for college and career readiness in English, language arts and mathematics will be implemented by the year 2014. Does this mean there will be MORE testing? Does this initiative burden our school budget or state budget? How does this affect my child? Attend the workshop to find out how this affects you and how you can be part of the process. This free workshop takes place next Tuesday, January 25th at 7:00 p.m. in the Falls-Lenox Primary School cafeteria. Free babysitting will be provided. Also, those attending this F/L – ECC PTA meeting have the chance to win one of two $25 gift certificates. It is that time of year again when OFMA will offer scholarships to seniors and to music students that will be attending summer music programs. Eligible senior students are college bound seniors who are currently involved in the music program in the Olmsted Falls School District. Seniors DO NOT have to be pursuing music as their major or concentration in college, they need only be enrolled in and planning to attend a four-year college or university. 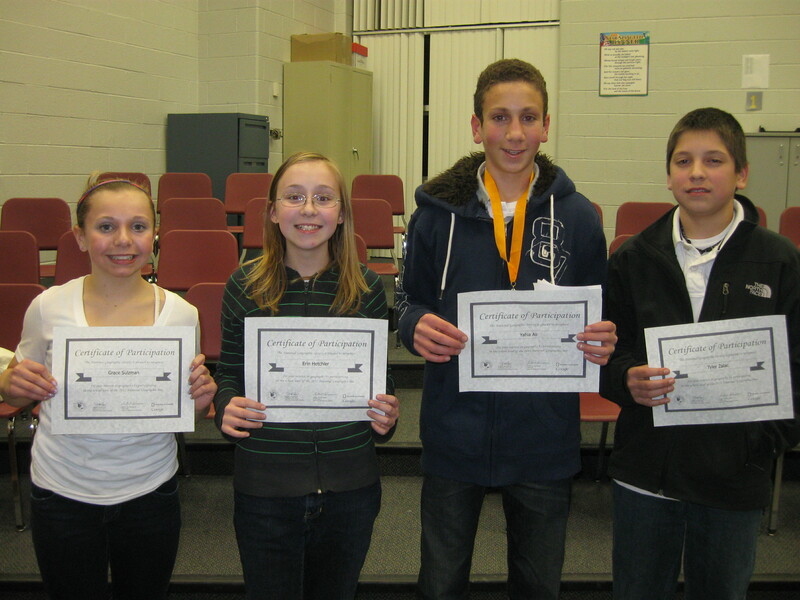 Eligible summer camp music students are current 4th to 12th grade students planning to attend a music specific camp during the summer of 2011. Seniors will need to fill out the “Local Scholarship Form” (in the guidance office) in addition to the OFMA application, in order to be eligible for a scholarship. Local Scholarship Forms are available in the Guidance Office and the deadline for submitting the Local Scholarship Forms is February 11th at 3:30 p.m. Senior OFMA applications are currently available through Mrs. Crandall. The judges will be looking at the senior student’s music involvement, grades, and involvement with extra-curricular activities. The deadline for senior OFMA applications to be turned into either Mrs. Crandall or Mr. Strelau will be March 25th. Remember that both forms must be completed and submitted by the appropriate deadlines (Feb. 11th for Local Scholarship Form: March 25th for senior OFMA application). For summer music camps, the applications will be available through the music teachers beginning January 18th. Due to early application deadlines of so many music programs, OFMA’s deadline will be February 24th for completed summer music camp forms. Please give completed applications to the music teachers by February 24thin order to be eligible. As in the past two years, the applications will be reviewed by a non-biased group, not affiliated with OFMA or Olmsted Falls City Schools, including college professors and college administration. Not every student submitting an application will receive a scholarship. Scholarships will be awarded based on the content of the applications in conjunction with the funds allocated in the OFMA 2010-2011 budget. Please see Ms. McClellan, Mr. Gulden, Mrs. Call, Mrs. Kiedrowski, Mrs. Crandall or Mr. Strelau for an application. Please contact Elizabeth Englehart, 440-346-2024, with any questions. BALDWIN-WALLACE COLLEGE “Take a Kid to the Game” Events – Saturday, January 29th and Saturday, February 19th. All area students in grades K to 8 will be admitted free of charge to two upcoming Yellow Jacket women’s and men’s basketball doubleheaders with a paying parent or adult. For additional details, please click here. DANCE IT UP FOR KIDS HEALTH EVENT – Saturday, March 19th 11:00 a.m. – 3:30 p.m. @ Olmsted Falls Middle School – This PTA sponsored, district approved school/community event will be entirely funded by donated private and business goods and services with all proceeds to benefit the Early Childhood Center playground fund and a children’s health charity. Our goals are to show kids and families that exercise and healthy eating can be fun and family focused and to raise money for some great causes. A few of the scheduled event activities for all ages include: Old fashioned “mini” dance marathon with participants soliciting pledges to dance; dance exhibition of both amateur and professional individuals and groups; Wii family dance stations; and healthy refreshments and health education and vendor booths. This has the potential to be an amazing event but we need your help. Please help us share this information by encouraging any OF person, organization, church group or business you think might be interested in participating to contact dzhaviland@yahoo.com if they are able to help with this event. Thank you!! Tomorrow’s scheduled all-day field trip for P.M. kindergarten students is still on as planned. P.M. students are to report to school in the morning as scheduled. Also, as originally planned, A.M. kindergarteners will not have school tomorrow. The field trip for A.M. kindergarteners will be rescheduled to another date and parents will be kept updated once the new date becomes confirmed. The Ohio School Boards Association celebrates School Board Recognition Month each January to build awareness and understanding of the vital function an elected Board of Education plays in our society. The Olmsted Falls School District is joining with other districts throughout the state this month to recognize the important contributions school board members make to their communities. School Board Recognition Month honors the members of Ohio’s 719 city, exempted village, local and joint vocational boards of education and educational service centers governing boards for their commitment to maintaining local control and providing quality public education to Ohio’s school children. Front Row (L to R): Olmsted Falls Board of Education President Mr. Frank Pedicini and Vice President Mr. Joe Bertrand. Back Row (L to R): Board of Education Members Mrs. Rhonda McCrone, Mr. Jim Weisbarth and Ms. Michelle Theriot. These public servants are elected to serve by local citizens and receive little compensation for their tireless efforts. In fact, in Olmsted Falls, Board of Education members donate back the small salary they do receive into the Local Scholarship Fund to benefit Olmsted Falls High School graduates each year. Please join us in expressing sincere appreciation to Mr. Bertrand, Mrs. McCrone, Mr. Pedicini, Ms. Theriot and Mr. Weisbarth for their time, effort and year-round commitment to maintaining educational excellence for our students. 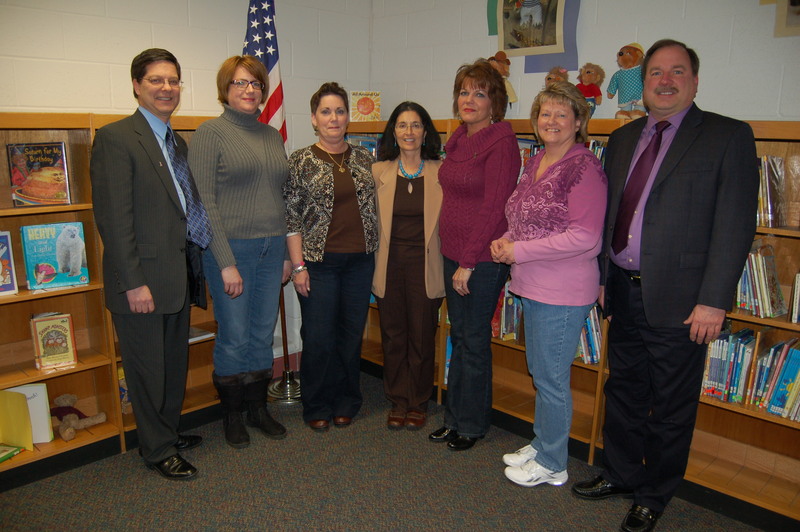 Last week, the Olmsted Falls Board of Education held its Annual Organizational Meeting. At the Organizational Meeting, Mr. Frank Pedicini was elected to serve an additional year as Board President; and Mr. Joe Bertrand was elected to serve another year as Board Vice President. Board Member Mrs. Rhonda McCrone will serve as the Board’s legislative liaison for 2011. We extend both congratulations and thanks to these individuals for taking on these additional responsibilities in the coming year. 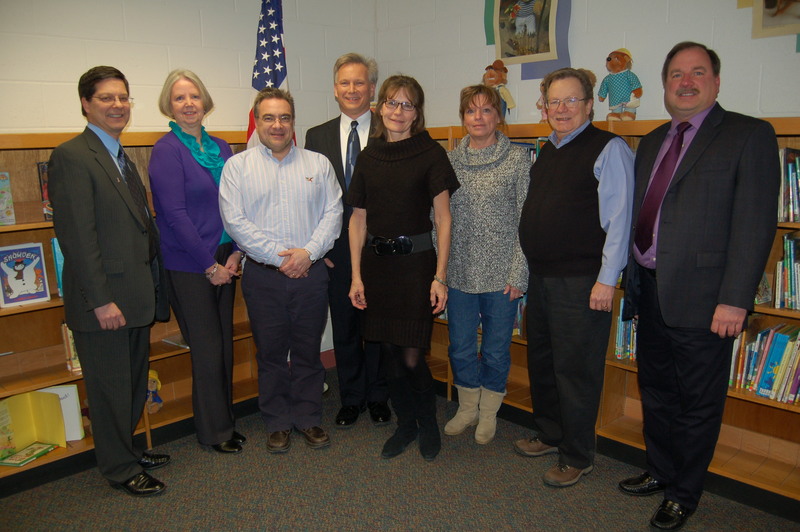 The Olmsted Falls Board of Education held a Special Work Session following its Annual Organization meeting last Thursday, January 6th. During the Board’s work session, discussion of the 2.8 mill drop-off, scheduled to occur in 2012, continued. The Olmsted Falls Board of Education continues to work to determine how to best proceed with this opportunity to potentially pass an issue to bring additional financial resources to our District without raising taxes for our residents. The Board will be making a final decision at its regular January meeting to determine if we will be on the ballot in May (or not), and to determine if we would be on with a straight 2.8 Mill Permanent Improvement levy or a 2 Mill Permanent Improvement levy and a 0.8 Mill Bond issue. Parents and community members are encouraged to contact the Board Office with any questions about the upcoming 2.8 mill “drop-off” and the Board’s discussions to date. Congratulations to OFHS Assistant Football Coach John Gaba, who has been selected as the Assistant Coach of the Year by the Greater Cleveland Football Coaches Association. This is a well-deserved honor for Coach Gaba. In addition to coaching, Mr. Gaba also teaches language arts and serves as the yearbook advisor at the High School. Congratulations are also being extended to OFHS football players Bill Budosh and Denton Sagerman, who have been named Academic All-Ohio by the Ohio High School Football Coaches Association. Both are currently seniors at OFHS. Please join us in congratulating all three of these outstanding Bulldogs! This first planning meeting for the “Dance It Up for Kids Health” event scheduled for tonight has been cancelled due to weather conditions. The meeting has been rescheduled to next Wednesday, January 19th from 7:00 – 8:30 p.m. at Falls-Lenox School Media Center. All interested individuals who would like to share their time, knowledge, enthusiasm and area of expertise are encouraged to attend. The “Dance It Up for Kids” planning committee is looking for individuals from high school students to seniors and local businesses that are willing to join a working committee and/or to donate money, goods or services to help with this event (see additional event details below in “Upcoming Events” section). Some of the things committees will be working on are soliciting donations and sponsors, marketing and advertising, soliciting event participants, and helping the day of the event. The annual freshmen semester exam study session will be held this Thursday, January 13th in the HS cafeteria from 2-4 p.m. All freshmen are free to stop in, enjoy a cup of hot cocoa and get help studying for exams. Semester exams will be given next Wednesday, Thursday and Friday, January 19th, 20th and 21st at OFHS. Please encourage to study, eat healthy and get adequate rest to allow them to make their best effort. Olmsted Falls High School students will receive their 2nd semester schedules this Friday, January 14th. Please check with your student to be aware of any start/end time changes from 1st semester. The second semester begins Monday, January 24th. Lisa Stevens from the Cuyahoga County Board of Developmental Disabilities conducted 3 special assemblies for students at Falls-Lenox today as part of the 5th Annual Disability Awareness Week. The assemblies - which were built around students' own questions - were sponsored by PTA. This week marks the 5th Annual Disability Awareness Week at Falls-Lenox. The week will include a variety of activities in order to continue to foster kindness and acceptance of those with differences, including assemblies sponsored by the PTA. Children at the Early Childhood Center participate in Disability Awareness Week activities as well. This year, ECC students will each be decorating their own butterfly to illustrate how they are all unique just like butterflies are all unique. For additional information or questions on Disability Awareness Week, please contact Robin Scott, School Psychologist, at 440-427-6432. Did you know that, in addition to our District’s five active PTA units, Olmsted Falls has a PTA Council comprised of representatives from all five of these units? The Olmsted Falls PTA Council, led this year by Council President Mercedez Hathcock, meets monthly throughout the school year to share information among its unit, collaborate on events and communicate directly with building and District administrators. Thank you to the members of Olmsted Falls PTA Council for their collective efforts and their positive impact on the students, faculty and staff of the Olmsted Falls School District. 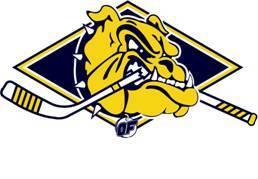 All 6th, 7th and 8th graders interested in playing high school hockey are invited to Junior Bulldogs Night with the Olmsted Falls High School Hockey team. The event will take place at Brooklyn Ice Rink – home of Bulldog Hockey – located at 7600 Memphis Avenue, Brooklyn, Ohio, 44144, 216-351-5334, on Tuesday, January 18th, 2011 at 7:15 p.m.
Student participants will get an opportunity to practice with the Bulldogs and get to know the team. Participants should bring skates and gear for practice. Parents must transport the skater to and from the rink. Please call Patti Daugherty at 440-235-8583 or Jill Petitti at 440-235-6464 to reserve your spot on the ice. There will be pizza and soft drinks for the skaters after practice so an RSVP is needed to know how much to get. The winning question was: Do you know the answer to the following question? Africa’s highest peak is part of a national park in Tanzania. Name this mountain. 8th grader Yahia Ali earned the chance to take the state-qualifying exam for a possible opportunity to compete in the state-level Geography Bee competition in April. The winner of the state competition will win an all-expense paid trip for four to Washington, D.C. to compete at the national level in May. Congratulations to all of these outstanding students who participated in the OFMS Geography Bee and best of luck to Yahia Ali as the competition proceeds! Olmsted Falls High School Alumni Association is looking for a new Director / Administrative Assistant. Part-time position for non-profit organization – eight to ten hours a week; two to three days. Salary $8,000 – $10,000 annually. No other benefits. Must be proficient with all Microsoft Office programs. Duties include event planning, office management, bi-annual newsletter, correspondence, maintenance of data base, bookkeeping, and attendance at monthly Alumni Association board meetings and all Alumni events. Please mail resume to Olmsted Falls Alumni, P.O. Box 38244, Olmsted Falls, OH 44138. 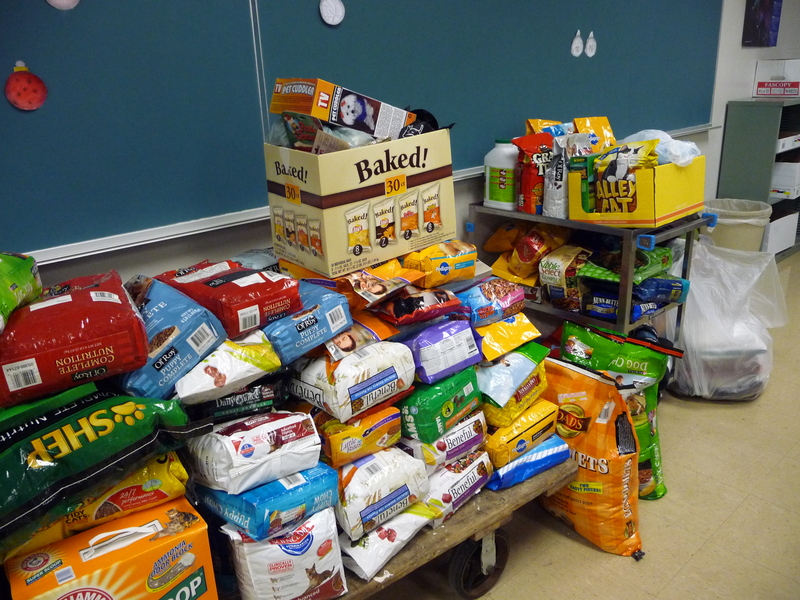 Biology & Anatomy students at Olmsted Falls High School recently donated a significant amount of pet supplies to the Berea Rescue Shelter and Love-A-Stray. Donations included more than 100 bags of dog food as well as cat food, cat litter, collars, leashes, toys and more. Thank you to OFHS Science Teacher Mrs. Bock for coordinating this charitable effort, and kudos to participating students and families for their generosity. Welcome back! We hope that all of our students, staff and their families enjoyed the long holiday break, and wish everyone the best in 2011. Before the new year gets into full swing, we’d like to take a quick look back. As 2010 came to a close, there was a flurry of activities throughout the District. Many of our teachers got creative in finding ways to reinforce learning targets while having some holiday fun. 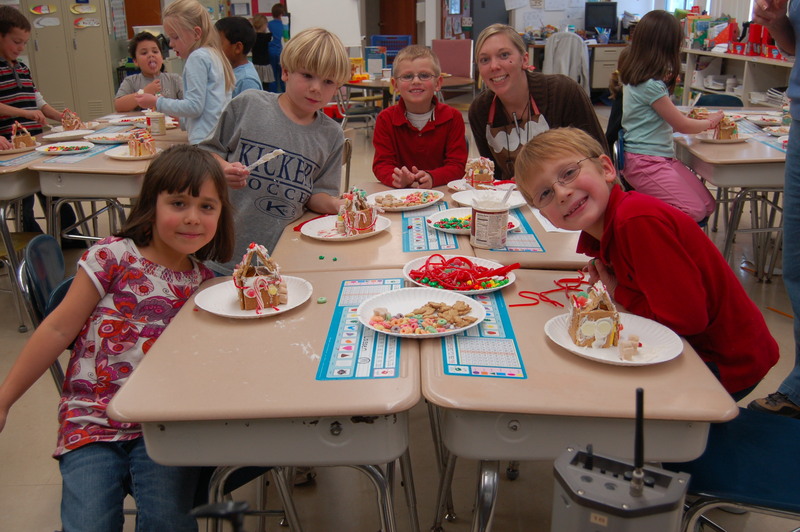 Parent volunteers joined first grade teacher Mrs. Julie Kemper (pictured here with students) to help students build their own gingerbread houses. This activity was the culmination of a unit that had students reading different versions of the story of the gingerbread man and integrating State standards throughout. The series of holiday concerts throughout the District are always one of the highlights of the season. With the snow day cancellation of the first of two scheduled High School holiday concerts, students and staff rallied to put on both scheduled performances in the same night. Family members and friends packed the auditorium…twice, as students performed a collection of holiday music. 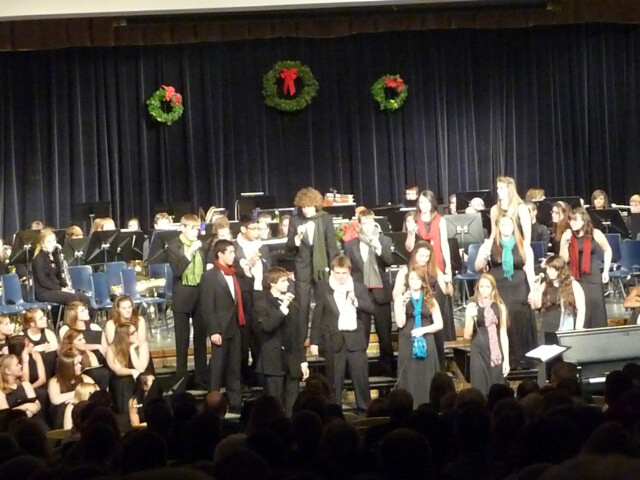 To see additional photos from the High School holiday concerts, please click here. High School student Amanda Abraham is pictured next to "The Giving Tree" donation site at Olmsted Falls High School. 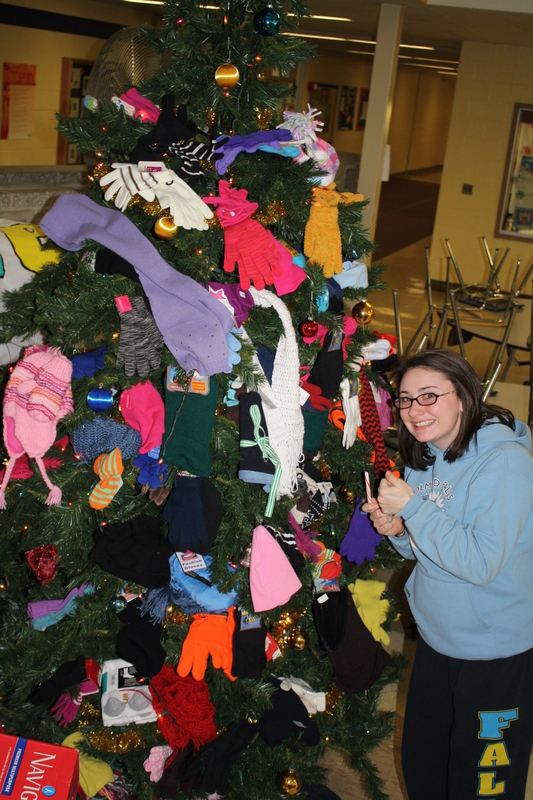 The Giving Tree – Buildings across the District collected gloves, hats and scarves as part of The Giving Tree project. All items collected were donated to the Olmsted Community Church for distribution to those in need. Food Drive – Olmsted Falls High School Student Council sponsored its annual food drive with more than 1,750 food items donated to the Olmsted Community Church. This impressive total surpassed last year’s donation of approximately 1,500 items. Olmsted Community Church helped disperse the food items to other churches in Olmsted Falls and Olmsted Township to help residents here in the Olmsted communities. “Sock Hop” with Kemper House – Students from Olmsted Falls Intermediate School donated new socks for a special project with Kemper House, a local retirement/assisted living facility here in Olmsted Falls. Approximately 100 members of the K-Kids club decorated the socks with puffy paint. Student sock designs included candy canes, reindeer and holiday messages. The finished holiday socks were then donated to residents at Kemper House. Students and staff not only dropped off the socks – they hosted a “Sock Hop” with the residents! More than 25 K-Kid students, along with Mrs. Ambrosia and Mrs. Eidam, danced the night away with residents at Kemper House – a memorable event for all! Toy Collection – First grade classrooms of Mrs. Kostraba, Mrs. DeLuca, Mrs. Vasco and Dr. Kolozvary collected unwrapped toys for a local charity called Christians in Action which serves families in Olmsted Falls and Olmsted Township. Approximately 75 items were collected and donated, including large ticket items such as a brand new bike! Olmsted Falls Schools and our local public library have a long tradition of working together to bring enhanced learning opportunities to our students and families. The library’s annual Summer Reading Program is one great example. In recent months, restructuring of local library services has brought new initiatives into our schools. 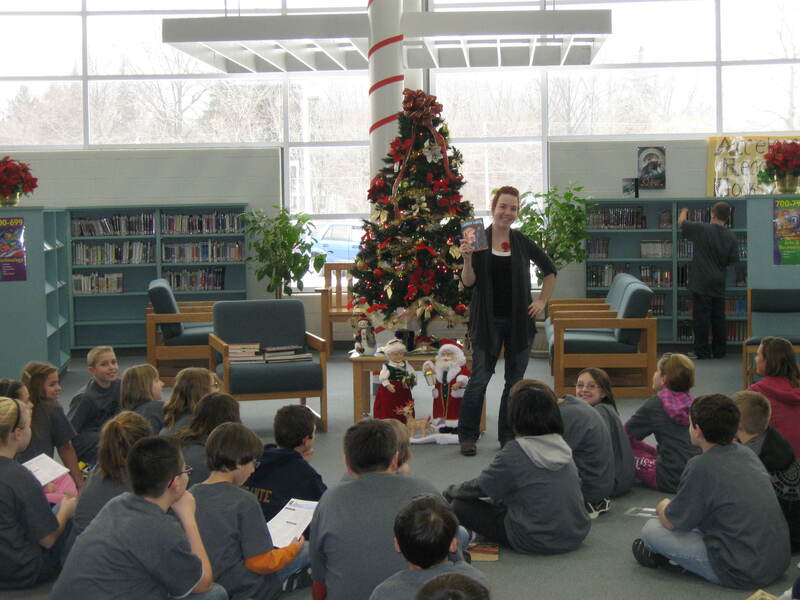 In early December, Ms. Angeline Kapferer, the Teen Librarian for both North Olmsted and Olmsted Falls library branches, visited 6th grade students in the Middle School Media Center to give a book talk and inform students about programs currently available through Cuyahoga County Public Library. Watch the blog in the coming weeks for the latest information about available library programs such as homework centers. Thank you to Ms. Kapferer for making this special visit to Olmsted Falls Middle School! NEW YEAR’S RESOLUTION: GET INVOLVED! Middle School PTA – Tuesday, January 11th @ 7:00 p.m.
High School PTA – Monday, January 24th @ 7:00 p.m.
Falls-Lenox/ECC PTA – Tuesday, January 25th @ 7:00 p.m.
Intermediate School PTA – Tuesday, January 18th @ 7:00 p.m. This PTA sponsored, district approved school/community event will be entirely funded by donated private and business goods and services with all proceeds to benefit the Early Childhood Center playground fund and a children’s health charity. Our goals are to show kids and families that exercise and healthy eating can be fun and family focused and to raise money for some great causes. A few of the scheduled event activities for all ages include: Old fashioned “mini” dance marathon with participants soliciting pledges to dance; dance exhibition of both amateur and professional individuals and groups; “WI” family dance stations; and healthy refreshments and health education and vendor booths. We are looking for individuals from high school students to seniors and local businesses that are willing to join a working committee and/or to donate money, goods or services to help with this event. Some of the things committees will be working on are soliciting donations and sponsors, marketing and advertising, soliciting event participants, helping the day of the event. Our first meeting is Wednesday, January 12th from 7:00 – 8:30 p.m. at Falls-Lenox School Media Center and we welcome all interested individuals who would like to share their time, knowledge, enthusiasm and area of expertise. This has the potential to be an amazing event but we need your help. Please help us share this information by sending this email to any OF person, organization, church group or business you think might be interested. Contact dzhaviland@yahoo.com if you are able to help with this event and/or attend the meeting. Thank you! !